We participate in several affiliate programs. If you click a link and make a purchase we will receive a small commission. This is at no extra cost to you. Like most things in my life, I like my asparagus prepared simply. I love to just steam it lightly. Then I take some extra virgin olive oil, a few drops of lemon juice, a touch of salt and some freshly shredded parmesan. I toss everything together and that is it. I am getting hungry just thinking about it. Unfortunately, the harvesting season for asparagus is for such a short period it is hard to enjoy it all year long. But, the good news is that if fresh asparagus is blanched and frozen, it will preserve well. Asparagus is typically thought of as being green. But, there are purple hybrid varieties as well. Don’t get too excited about this. If you cook the purple asparagus it will revert back to the green color. That is not the case for white asparagus. It is most desired because it is considered less bitter and more tender. The white color is obtained by keeping the asparagus covered with dirt while it is growing. There is no exposure to the sun so there is no photosynthesis which produces chlorophyll. The chlorophyll is what causes the green color. This plant is a perennial, which means that it lives more than 2 years. Actually it will last a lot longer than that. A well maintained asparagus bed may live up to 15 – 20 years. The plants grow 39″ to 84″ tall. Asparagus is approximately 93% water. Plants are either male or female. Female plants produce a red berry which is poisonous. They will appear after the fern like leaves are already open. There are some hybrid varieties available that only produce male plants. These hybrids are also resistant to some of the more common diseases that plague asparagus such as Fusarium or crown rot. Asparagus does not like to compete with weeds. Be sure to keep your bed weed free. 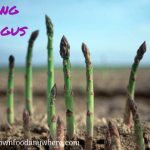 Asparagus will only grow in zones 4 – 8. 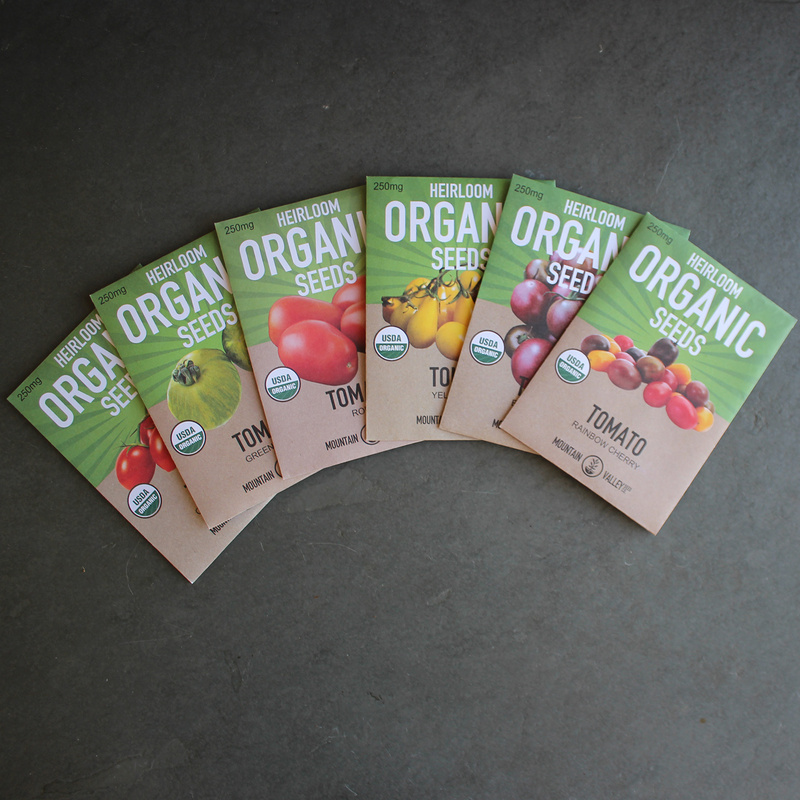 You can plant this from seeds, but it will add an additional year onto the time to harvest. Most people will plant crowns. These are 1 year old dormant plants that can be purchased from seed companies. Yes, they are more expensive than the seeds, but considering the lifetime of the plants, I would opt for getting to harvest a year sooner. This is a plant that does extremely well in a raised bed growing situation. Crowns should be planted in sunny, well drained, loose soil in the Spring and in the Fall in some warmer climates. In the Spring you should plant outside 4 – 6 weeks before the last frost date. It prefers a pH of 6.5 to 7.5. 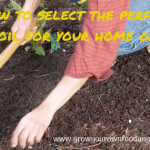 You should test your soil first and amend before planting if needed. To plant dig a trench that is 12″ to 15″ wide and 6″ to 8″ deep. If you are planting multiple rows they should be 3′ apart. Soak your crowns in water for 15 – 30 minutes before planting to be sure they are hydrated . Place a small mound of dirt in the bottom of the trench. Place your crown on this. Be sure to fan out your roots around the crown. Fill in you trench . Water immediately after planting. Cover your bed with mulch to help control weeds and maintain moisture levels. Do not use straw as it may contain seeds. Asparagus grows best in temperatures of 65 to 85 degrees F.
Production is inhibited at temperatures of 50 degrees F or lower. Keep your beds weed free. Do not over water as this plant does not like wet roots. Keep any mulch off of the plants as it may cause rot. During the first year you should maintain the plants per their requirements. But, you will not harvest during the first year. During the second year you can harvest lightly. The third year is when the bed starts to come into full production. Plants should be harvested when they are 6″ to 8″ tall. 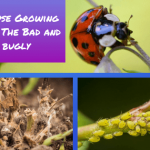 You should not harvest plants that are under 1/4″ in diameter. With ideal growing conditions this plant will grow rapidly. You should check for plants to harvest daily during the short 8 week harvest period. You should cut the plants at the soil level using an asparagus knife. Asparagus can be steamed, boiled or blanched, roasted, stir fried or it can be eaten raw. Asparagus can also be preserved by freezing or pickling. It is simple to prepare. The woody ends must be removed. To find where this is you would simply hold each end of the spear and flex it. The best way to do this is to just break it while you are bending it. You can however pile up the whole batch and use a knife to cut off the bottoms. Asparagus should be thoroughly rinsed under water before cooking or eating. This plant is high in many vitamins, but it has very few calories. It is a good source of antioxidants and has been known to help lower blood pressure. Plus, it is simple to prepare and oh yeah, tasty. 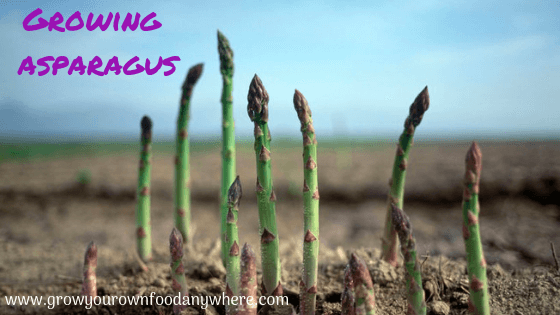 Go out and plant some asparagus today! You want a greenhouse. You know it will build up a lot of heat during the day. Even on sunny days in the middle of the winter. You want to put it by your garden in a remote corner of your lot. Or maybe, on some land that you own that is undeveloped. What do you do? 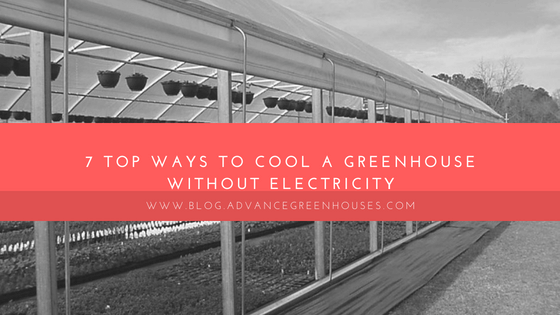 Fortunately, there are multiple options for cooling your greenhouse even when you don’t have electricity. Let’s take a look at the options. This one is a no brainer. Just install a shade cloth over the top of your greenhouse. It has much the same effect as standing under a shade tree in the summer. The shaded area will be cooler. 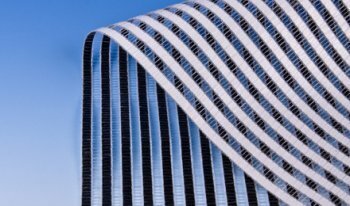 Shade cloths are available in a woven, knitted or reflective material. The woven material will ravel when cut and it is necessary to put tape on the edges. Knitted shade cloth has more give than the woven and does not require taping, although we prefer to do this as you can then put grommets in the tape. 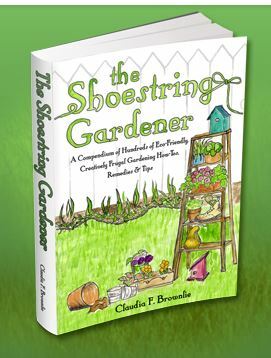 You can run a bungee or cord through the grommets to attach the cover to your greenhouse. There is also a reflective cloth available which is much more efficient. 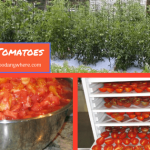 They result in lower greenhouse temperatures and a more consistent environment. Shade percentages run from 50% to 70% for greenhouse use, maybe lower for plants will low light requirements. 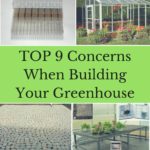 Chances are if you are purchasing a greenhouse kit, it will have roof vents. 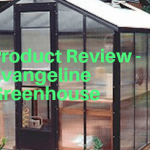 There are very few kits out there without roof vents, and if you are building your own greenhouse, this is a highly desirable feature. We all learned in high school that warm air rises. 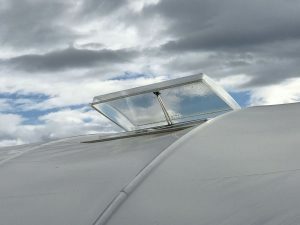 Have an opening such as the roof vent in the top of your greenhouse, and the hot air will exit. Manual roof vents are available, but the best way to take advantage of this feature is to have a solar powered opener on it. That way if you are not at the greenhouse every day, you will know that the vents are opening and closing at appropriate times. These solar powered openers are basically wax cylinders. They work on the principle of contraction and expansion. When they get warm they expand, pushing the vents open. When they get cool they contract, pulling the vents shut. These can be adjusted to a certain degree to open and shut at desired temperatures. 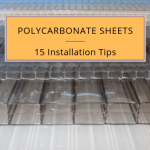 There are also roof vents available that will go directly into a polyfilm greenhouse without additional framing. They have the solar powered openers. These vents can be retrofitted onsite to fit in a polycarbonate greenhouse. 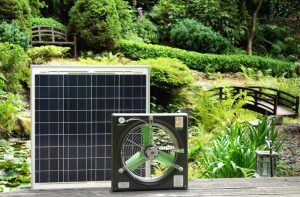 If you place a side vent with a solar powered opener below your roof vents you will get even better ventilation in your greenhouse. We like to place these approximately 6″ from the bottom of the greenhouse. This will give you a chimney type effect drawing the air from the bottom to the top of the greenhouse. We also use the wax cylinders on these to keep things simple. 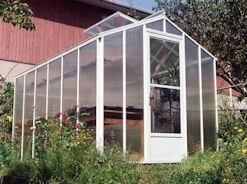 If you have a greenhouse with straight side walls you can install roll up curtains. 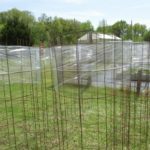 Using these you can roll the greenhouse sides up during the hottest times of the year. These systems operate with a hand crank or can be automated. These come with a heavy duty 12 mil coated weave fabric. It is recommended to use a kneewall with these systems. That way your plants will have protection from the wind when the curtains are open. Also, if you are in a heavy snow area, this will keep the snow from laying up against your curtain. These operate on the same principle as a wired ventilation package. But, they are powered by a solar panel. The exhaust fan goes up high in the backwall of the greenhouse. The intake shutter(s) go down low on the opposite wall. The exhaust fans are wired to a thermostat. The manual intake shutters will open to allow fresh air into the greenhouse. The exhaust fan will draw this air through the greenhouse, cooling the air. No electricity is required, you are creating your own power. 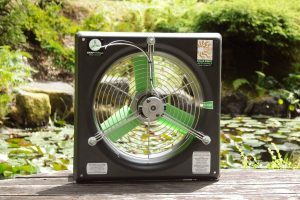 Circulation fans are essential to the healthy greenhouse. They will increase CO2 availability, an essential for plant growth. They help to reduce excessive moisture creating an environment which reduces disease and pests caused by humid environments. They also help strengthen the plant stems with the same motion as a mild breeze when the plants are grown outside. These are fans that run low and slow. Misting systems may be used if you have water to your location. They will help to lower the heat in a greenhouse. These can be set up on a battery operated timer, so no electricity required. These cause a cooling effect by tiny water droplets evaporating. I have been fighting an uphill battle at times throughout the years. New greenhouse owners just do not understand the heat that will build up in a greenhouse during sunny days, even in the middle of winter. I have seen my ventilation package come on during a sunny 60 degree February day. And, I keep my thermostat set at 90 degrees. Quite a difference that you really would not expect unless you have experienced it. 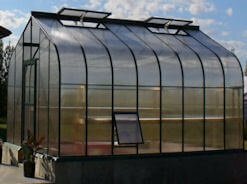 Proper ventilation is an essential item for your greenhouse. 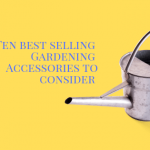 It will keep your plants healthy and happy. No more baked tomatoes on the vine. You will have to pick them and put them under the broiler in the kitchen for that! 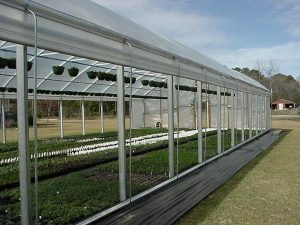 These options discussed above provide you with the opportunity to supply adequate ventilation to your greenhouse even when they are in an area with no power available. So, no more excuses. 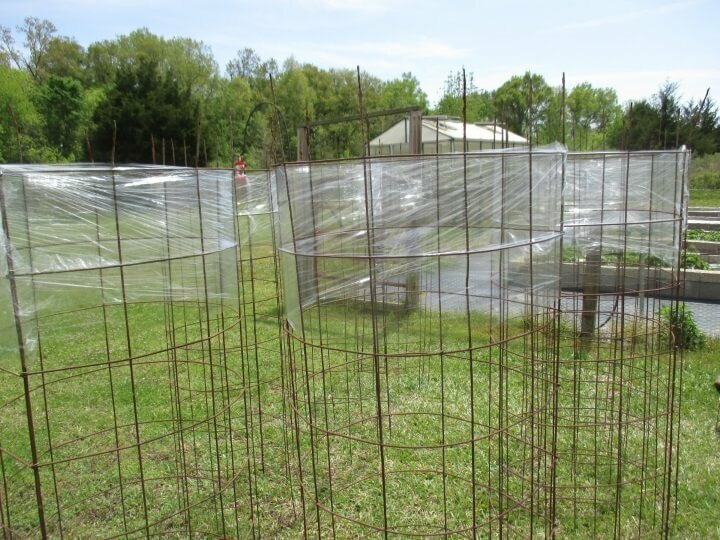 Get out there and build yourself a greenhouse today. 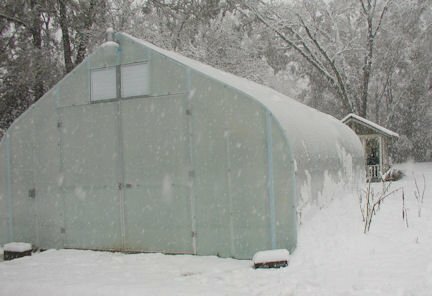 I will also be discussing heating your greenhouse without electricity when the season dictates. Good Growing!